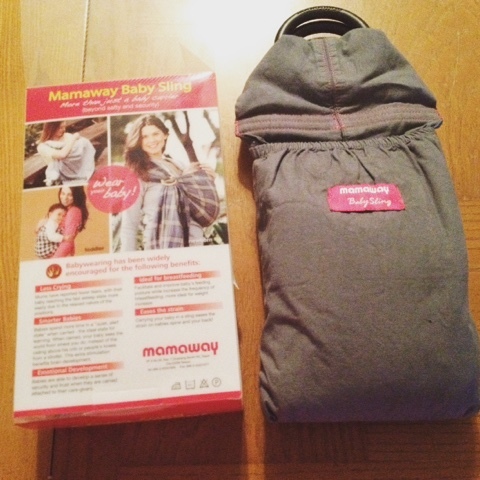 I recently had the opportunity to review the Mamaway Ring Sling. Mamaway is an Australian based company providing maternity and breastfeeding clothes, as well as other products like rings slings and baby clothes. I love their focus on breastfeeding and the unique variety of clothes they offer. 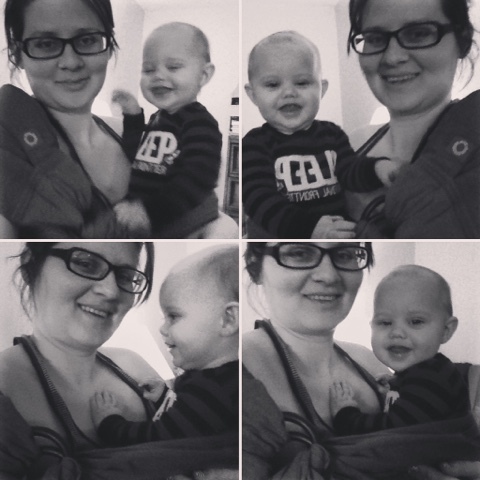 I also love babywearing! 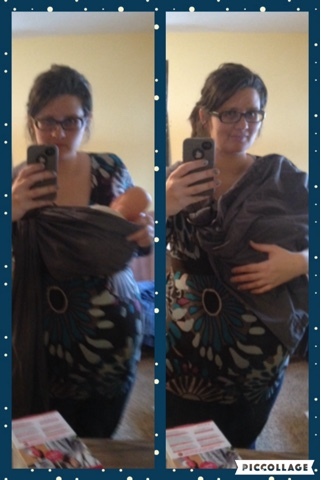 I've used a variety of different soft-structured carriers (SSCs) with buckles or ties, stretchy wraps, and a few non-adjustable slings but had never tried a ring sling. The Mamaway ring sling comes in a variety of different patterns and colors. I was given the Vintage Washed Out design in Pewter Gray. The ring sling itself is easy to assemble and use - you basically just pull it out and thread it through the rings. (When not using it, it can be folded back up into the pocket shown in the picture above.) It can take a bit to figure out just how to adjust it - especially if you have a ginormous pregnant belly like me! - but Mamaway has an abundance of videos on YouTube that demonstrate how to do the different types of holds. There's also a super handy one that discusses frequently asked questions about the slings. I came to find out it's easier said than done to get pictures of your busy, bouncing one year old in the ring sling at almost 38 weeks pregnant. As evidenced by the picture below...he kept trying to bounce while I tried to manage the camera! Since my one year old is no longer nursing, I borrowed one of my daughters baby dolls to show how you could easily breastfeed in the ring sling - something I've had trouble doing with my SSCs. It would be simple to adjust the rings slightly to maneuver baby into a comfortable nursing position and then you could use the tail of the sling to cover yourself and/or baby - as I've done in the picture below - if you so desire. I feel like that would be easier than trying to loosen ties or buckles. Disclosure: I was given a Mamaway Ring Sling in exchange for my honest opinion of the product. All views expressed are my own and no other compensation was given.